The Council of Islamic Ideology (CII) has clarified that it is not considering drafting a new nikahnama (marriage certificate) that would guarantee women the right to divorce their husbands unless they explicitly waive it themselves. Although a provision allowing women to dissolve their marriage already exists in the current marriage document, it is often not enforced and is said to be inelaborate. The council’s explanation comes in response to news reports that the council is in the process of drawing up a new marriage document that clearly enlists women’s rights, including their right to divorce. English-language daily The News, which first reported on the proposed changes in the nikahnama, had quoted the CII chairman as saying that the nikahkhwan (the person who solemnises a marriage) will in the future be legally bound to consult the bride on whether she wants her husband to give her the right to dissolve the marriage. “The nikahkhwan will be legally bound to inform the bride of her right to ask for dissolution of marriage,” Qibla Ayaz, the CII chairman, had told the daily. But in a statement issued on Monday, CII spokesman Ikramul Haq said no such marriage document was under consideration that would include a clause clearly allowing women to divorce their husbands. “However, the council is working on a nikahnama and a talaqnama (divorce deed) whose language will be simple and easily intelligible,” he added. According to Haq, necessary clauses will also be added to the documents to make the family system stronger and more consistent in light of teachings of the Holy Quran and Sunnah. Also being considered are proposals to ensure details of national identity cards are entered in the nikahnama and the “role of the nikahkhwan is made effective and documentary”. “The scholars will be taken in confidence on the draft for the nikahnama and talaqnama, which will be presented for formal approval in a meeting of the council,” Haq said. The CII is a statutory body with a minimum of eight and a maximum of 20 members, including one woman, whose function is to advise parliament on whether laws are in consonance with Islamic injunctions. 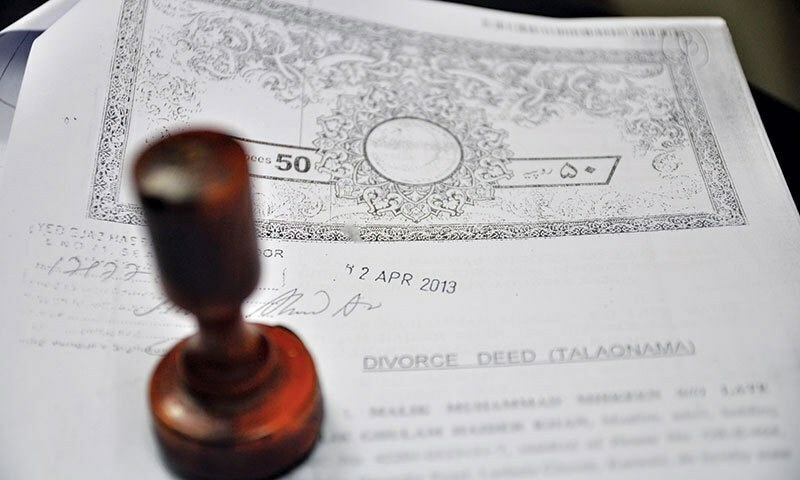 Although the provision allowing a woman to dissolve her marriage is already present in the existing marriage certificate, it is often not enforced, leading women to opt for the tedious and costly path of obtaining a khula through a court. But a khula is conditional and not the same thing as a right to divorce one’s husband. Khula is when a woman initiates dissolution of the marriage in court, which she can obtain even without her husband’s consent provided she foregoes her mehr, maintenance and alimony. A woman has to get a lawyer, prepare a case and then the judge decides if she will be granted one or not. In contrast, when a woman is “delegated” the right to divorce in the document, she can simply opt out of the marriage using the same legal procedures as are ordinarily followed by men. Clauses 18-19 of the existing nikahnama accommodate right to divorce, the first of which asks whether the husband would like to delegate the right to divorce to his wife and the latter asks if the husband’s right to divorce has been curtailed in any way. Often, these sections are struck out completely, sometimes by the qazi officiating the marriage or by family members because they don’t want to think about the dissolution of the marriage at the auspicious time of its beginning or simply because they deem it unnecessary since a woman always retains her right to a khula if things go awry. The proposed changes in the nikahnama reported last week would have barred the marriage officiator from deleting those sections. “They won’t be able to do that anymore and there would be legal consequences for that and the nikahkhwan would not able to delete it without the consent of the bride-to-be,” the CII chairman had told The News.